Fit for a King or Queen. Children love pretending to be royalty once they adorn their very own, hand decorated crown. 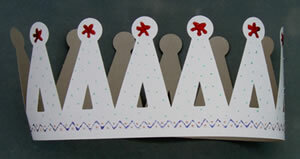 These white card crowns are great to colour in and decorate. They are easy to fasten and can be adjusted to fit. They come in two designs.